If you love dogs, especially purebred dogs, membership in the PCCI is a must. You will have a ready network of individuals who share the same interest and at the same time, you will have access to the most extensive information resource on purebred dogs in the Philippines. 1. Download the PCCI Membership Card Form from the Application Forms Section of this website. You may also request for the form either personally if you visit the PCCI office or by emailing your request along with your complete name and address to documentation_pcci@yahoo.com. 2. 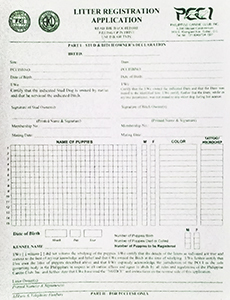 Fill-out and sign the PCCI Membership Card that serves as your application form.